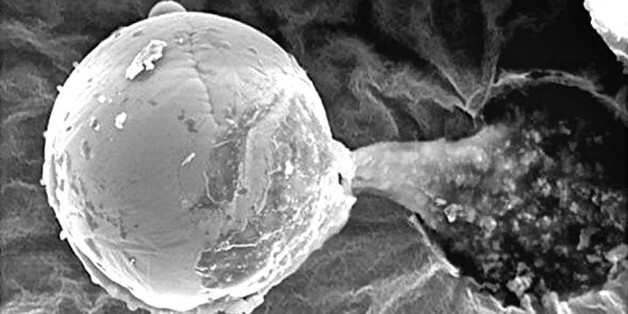 Scientists in the U.K. have examined a tiny metal circular object, and are suggesting it might be a micro-organism deliberately sent by extraterrestrials to create life on Earth. Don’t be fooled by the size of the object in the microscopic image above. It may appear to look like a planet-sized globe, but in fact, it’s no bigger than the width of a human hair. The University of Buckingham reports that the minuscule metal globe was discovered by astrobiologist Milton Wainwright and a team of researchers who examined dust and minute matter gathered by a high-flying balloon in Earth’s stratosphere. “It is a ball about the width of a human hair, which has filamentous life on the outside and a gooey biological material oozing from its centre,” Wainwright said, according to Express.co.uk. “One theory is it was sent to Earth by some unknown civilization in order to continue seeding the planet with life,” Wainwright hypothesizes. That theory comes from a Nobel Prize winner. “This seeming piece of science fiction — called ‘directed panspermia’ — would probably not be taken seriously by any scientist were it not for the fact that it was very seriously suggested by the Nobel Prize winner of DNA fame, Francis Crick,” said Wainwright. Panspermia is a theory that suggests life spreads across the known physical universe, hitchhiking on comets or meteorites. The idea of directed panspermia was suggested by Crick, a molecular biologist, who was the co-discoverer of the structure of DNA in 1953. Twenty years later, Crick co-wrote — with biochemist Leslie Orgel — a scientific paper about directed panspermia. 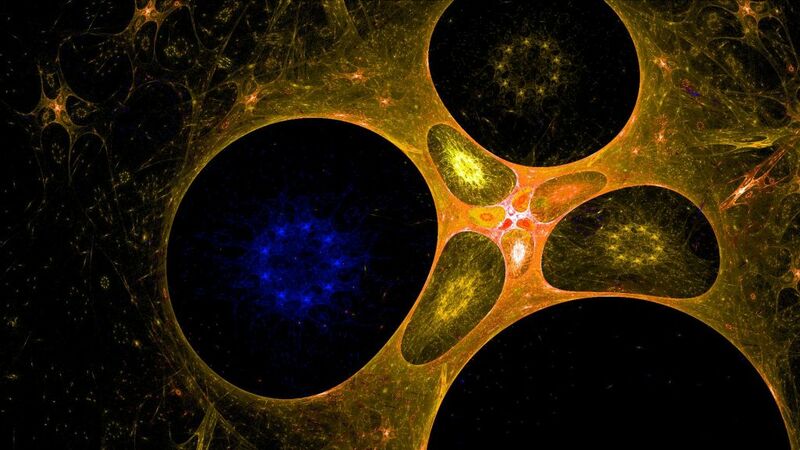 It now seems unlikely that extraterrestrial living organisms could have reached the Earth either as spores driven by the radiation pressure from another star or as living organisms imbedded in a meteorite. As an alternative to these nineteenth-century mechanisms, we have considered Directed Panspermia, the theory that organisms were deliberately transmitted to the Earth by intelligent beings on another planet. We conclude that it is possible that life reached the Earth in this way, but that the scientific evidence is inadequate at the present time to say anything about the probability. We draw attention to the kinds of evidence that might throw additional light on the topic. In contrast to what Crick-Orgel speculated about in 1973, four decades later, a team of scientists, led by astronomer-astrobiologist Chandra Wickramasinghe of the Buckingham Center for Astrobiology, announced they had found fossils with biological properties attached to a meteorite (check out the slideshow at the bottom of this story) that fell in Sri Lanka. Of course, these controversial claims bring forth the skeptical side of science. In the case of the meteorite fossils, astronomer Phil Plait wrote that the scientists didn’t do a good enough job convincing him there were actual fossils in that meteorite. 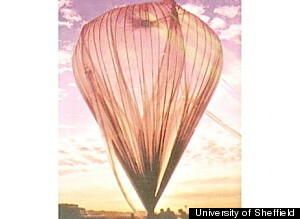 Wainwright and his team launched balloons nearly 17 miles into Earth’s stratosphere, and when they examined the material collected by one of the balloons (like the one pictured below), they discovered a small crash mark which indicated to them that the microscopic, circular object didn’t simply land softly. “On hitting the stratosphere sampler, the sphere made an impact crater, a minute version of the huge impact crater on Earth caused by the asteroid said to have killed off the dinosaurs,” Wainwright said. Even with this more recent discovery of a tiny globe found lodged into a high-flying balloon, the alien space seed proponents know they have a long way to go before that can be proven and accepted by the scientific community. “Unless, of course, we can find details of the civilization that is supposed to have sent it in this respect, it is probably an unprovable theory,” Wainwright conceded. Time — and space — will tell.